Alas no Dr Simmonds (feeling poorly) and no Chris Richards (recovering from toe surgery) . Having said that, quite a good turnout for the iffy conditions that greeted us. There was a stiff breeze turbulated by the trees coming just about SSW direction. Those notables among the fire breathers were John and Mark Digby, Mike Stuart, Derek Knight, Andy Sephton and yours truly. I did however keep my eyes on the competition: Andy Sephton had some really good flights with profile HP Victors and a yellow DH110 Sea Vixen. 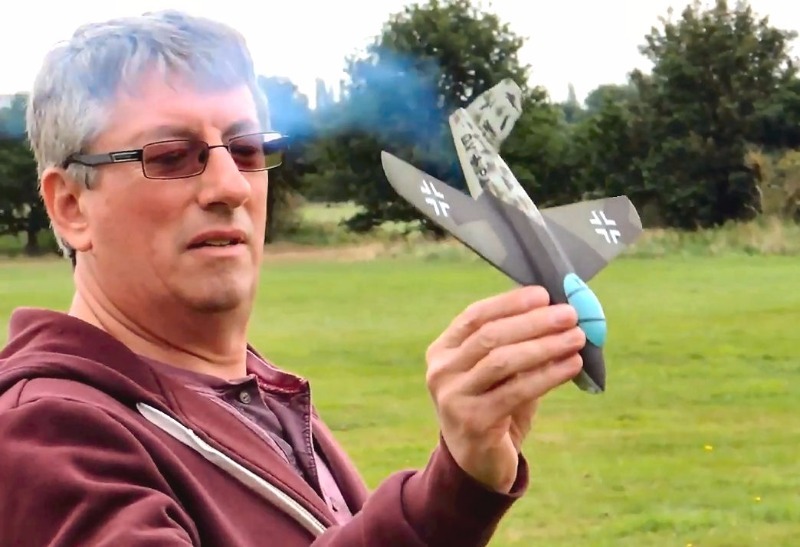 Although Mike scored high static points for his F105 Thud, he couldn't get a 10 second plus flight. And now to the Digby clan, who really did make my day with their easy humour and companionship. Yes, they did a clean sweep of the top spots in both categories. I don't begrude it at all, because in that flukey breeze it had to be earned. 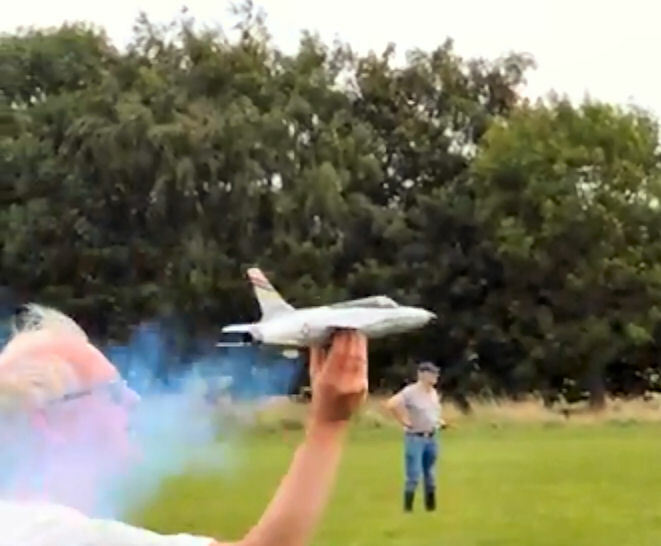 Mark Digby's Saab Gripen put in a flight of ar*e kicking proportions to win profile scale. Above: Mark Digby's Gripen. We saw this at Old Warden and been badgering him for the Template ever since! Without the docs my DH108 got 5th in scale, but I did get second in profile. 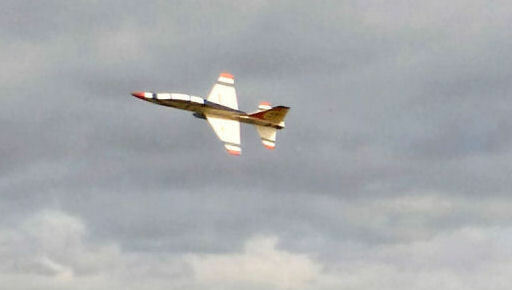 Above: The T-38. A great flier. Nice flight. Pity about the documentation! 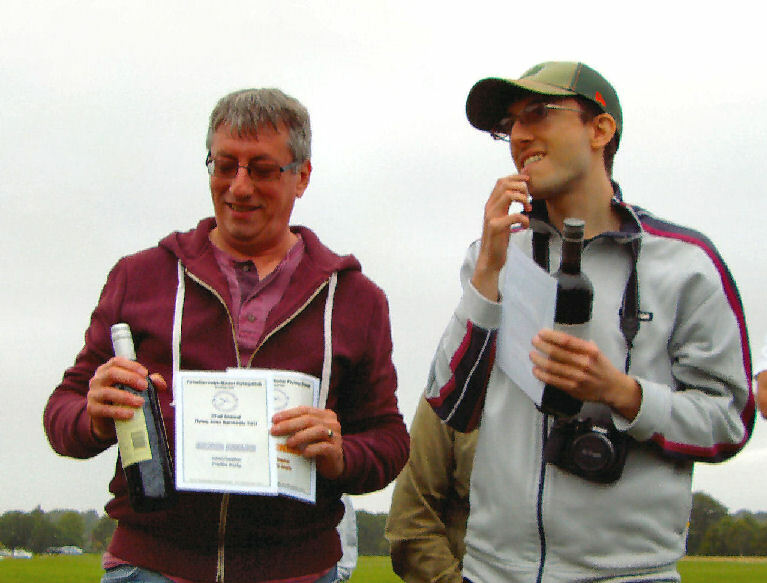 Above: John and Mark Digby looking happy with their triumph in both Rapier Scale classes. Despite the really rather unpleasant conditions, the rocket boys appear to have had a good time. 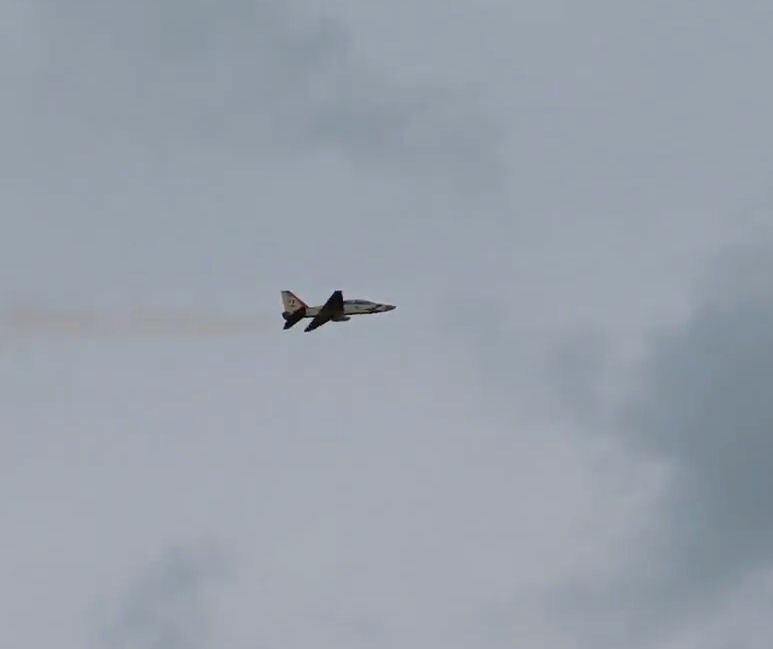 I particularly enjoyed Mark's Gripen - great to see this lovely design flying at last and Andy's T-38 Talon. Pity about Anfy Sephton's Victor which was nearly there ... but not quite. Here's to Old Warden later this month! I can't resist adding some 'stills' from Mark and John's video. What was so nice to see was the way the rocket flyers all helped each other and were pleased with each other's' good flights. I hope to get my hands on Mark's wonderful model's templates ... a jetex.org kit beckons (when the store is sorted out! These are inspirational flights. 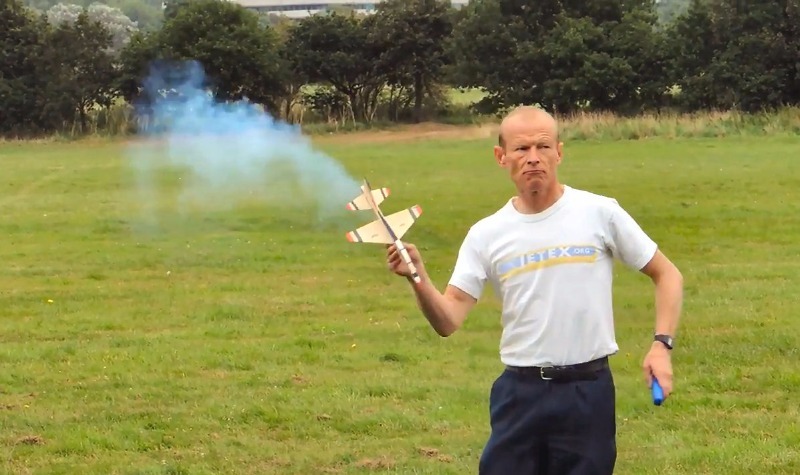 We have the motors, we have the models, we have some keen flyers, all we need is the weather! Thanks for posting the videos, I watched all the flights with great interest and I noticed that most of the models climbed steeply and looped (or tried to). Correct me if I am wrong but presumably down thrust tabs were not employed on them? Mostly the glides were very steep too which also tells me that the models were deliberately nose heavy (and probably with well forward motors) to try and prevent the steep climbs and looping. So why the reluctance to use a down thrust tabs? With less added nose weight the model is lighter, the flight is smoother and more realistic and the model glides for longer, what is not to like? The happy combination of a ‘whiff of power’ on a light model to get good flights is still available of course but the variability of Rapiers makes this very hard to achieve. Try it you will like it. After missing last years event we were particularly looking forward to the this one as the friendly competition is always good fun. 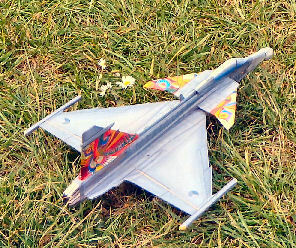 We both entered profile scale I was campaigning the venerable Junkers EF 128 hoping to improve on the second place achieved back in 2012 and Mark entered with his Saab Gripen but not until we had given it a few hand launches and its first flight under powered which suggested that it should make the minimum 15 seconds required for a qualifying flight. I laso had my Messerschmitt Me 263 which I entered in authentic scale, not a new model but only flown briefly in an unfinished state before the L1 motors available at the time became a little weak. With the availability last year of some 70mN motors I decided it should get a coat of paint and was duly finished unusually with time to spare a couple of days before the event. As already mentioned by Andy conditions were not ideal and the pressure started to mount as I was preparing for my first attempt only to find that my igniter with freshly charged batteries that was working fine before we left was now dead. Fortunately I had quite a collection of fuses amassed over several years and Andy was available with his gas cooker igniter so with some shielding from the breeze we eventually had some smoke and I launched for my first attempt completely in the wrong direction, I can still picture Marks expression when he said "what did you do that for". To cut a long story short after more trials and tribulations with motor ignition and a usually reliable model not wishing to play I eventually made a qualifying flight that I was to find out later was good enough to achieve second place. 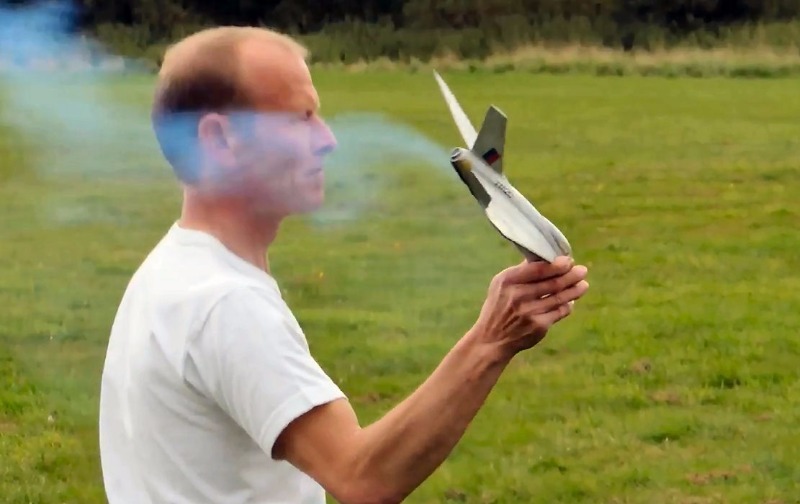 Mark had a similar experience with his Gripen, with the added pressure that the model had not even had a test glide before the event. CG position had been calculated using an online canard calculator and a few test glides when first arriving at Peterborough indicated that it was there abouts. During early attempts Mark was still learning how to launch the model not least we're to hold it and found himself with one attempt remaining and no qualifying score posted. I forgot to mention model was being flown using 90mN L2 LT motors as we only had a small number of L1 motors and I needed those for my models. 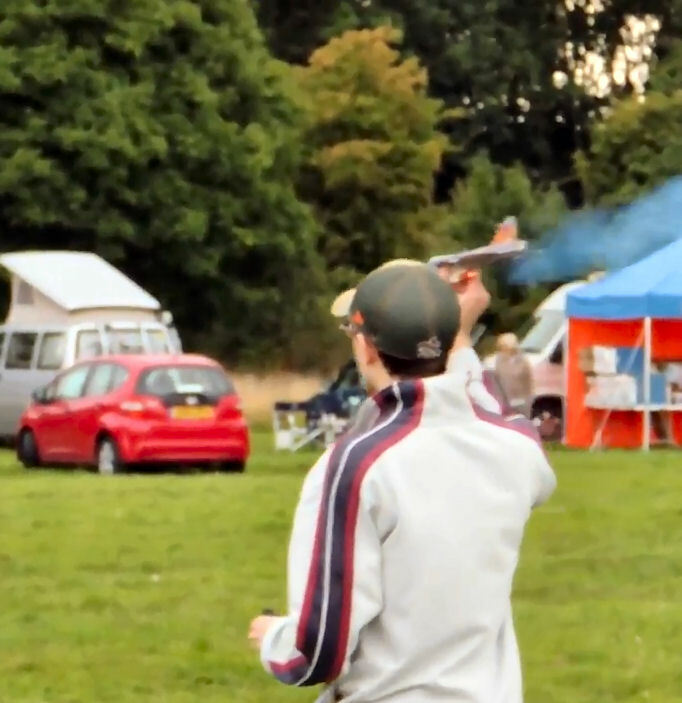 As you will have seen from the video at the last throw of the dice Mark launched into some good air and had a great flight much to the relief of those watching . Authentic scale was for me a little less eventful achieving a qualifying flight at the first attempt the the Me 263 seemingly well suited to the 70mN L1 motors. After Mike Stuart failed to achieve the required flight time with his Thud it was going to be between Andy and myself for gold and come the prize giving I was to find that one flight was good enough for the win. All in all a great day in great company and now looking forward to Old Warden in a couple of weeks. Hope you all enjoy the video?